The humble Post-It note had a rocky start, fighting for acceptance until it became a widely used and well-loved staple of offices everywhere. Today, the signature yellow color and repositionable nature of the Post-It are so well known that the name has become the generic identifier for any small piece of paper with a strip of adhesive on one side. So inspiring is this ubiquitous product that designers all over the world have taken to the drawing board and come up with their own unique takes on the concept. The balding man sticky note pad reminds users to do something about their hair loss before the hair is gone forever. The pad starts out with a thick column of “hair,” but one by one as the sheets of paper are used the hair gets thinner and thinner. The unique pad is a marketing tool for a hair-loss medication, and quite an effective one at that. Could this be the original iPad? 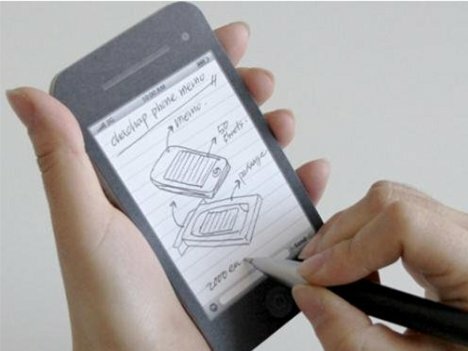 The sticky notes that look like an iPhone are way cheaper than the do-everything mobile phone…and you can share the Apple-like aesthetic with everyone you know. As an added bonus, when you mess something up, you can just crumple it up and throw it away – unlike when you make a mistake on your actual iPhone. 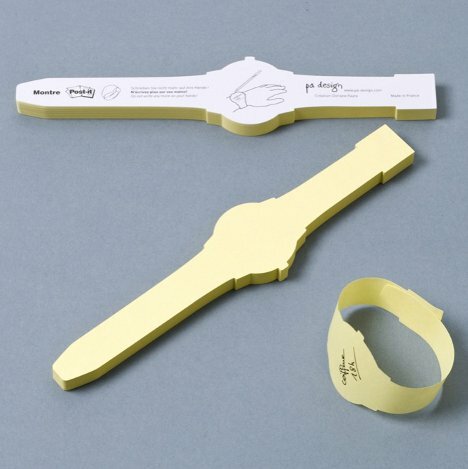 As an official Post-It product, this pad of watch-shaped sticky notes is meant to give you the convenience of repositionable reminders on the go. But if you feel really cheeky and silly, you could just draw a watch face on one. 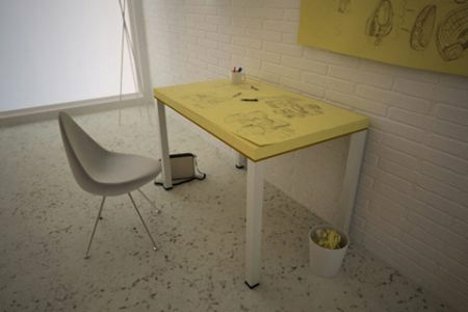 The Post-It Table is for when your ideas are just too big for that miniature yellow pad. The tabletop is composed of super-size Post-It notes that you can write all over, then hang them up on the wall to remind you of your brilliant ideas. If your mom ever yelled at you for writing reminders on your hand, the Talk to the Hand sticky note pad will keep you both happy. 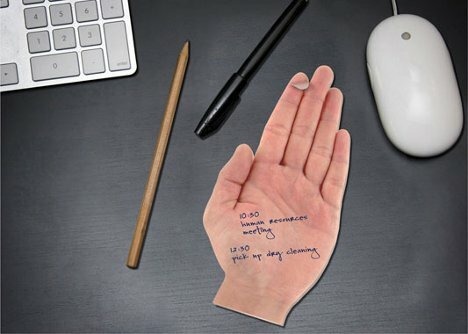 The notes look like a remarkably lifelike hand which you can write on and stick just about anywhere. 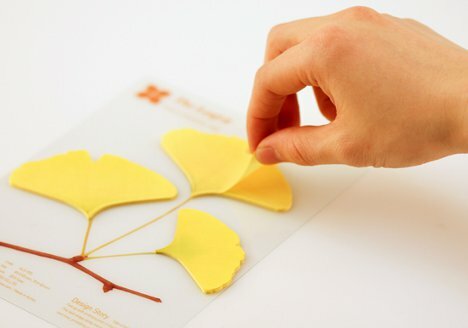 The leaf sticky notes from Appree take little pieces of paper back to their origins by giving them the shape and colors characteristic of living plant leaves. 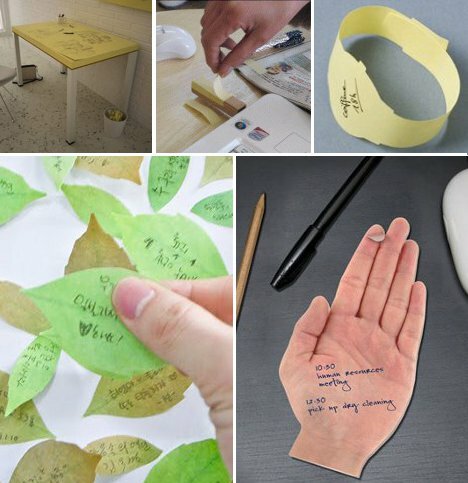 The very cute sticky notes come on cards decorated with twigs, making it looks just as if you are plucking live leaves every time you have a reminder or note to share. The signature yellow Post-Its color is great, but of course it is a little…sunny. Now, these very sleek black Post-Its are available for impressing all of your office mates. 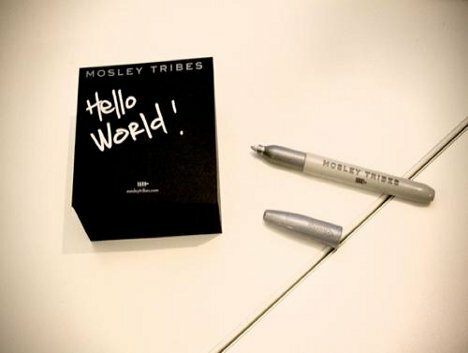 The pad even comes with its own silver metallic pen that perfectly complements the dark pages. 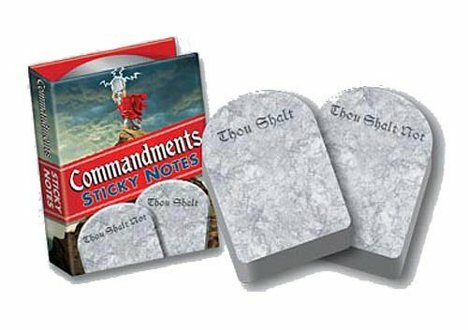 The Commandments sticky notes are excellent for people who like to lay down the law via sticky note memos. The pads look just like stone tablets with “Thou Shalt” or “Thou Shalt Not” across the top, making them seem like orders from a higher authority. One of the games of youth (one of the more boring ones, we admit) involved pulling petals off of a flower one by one to tell the future or answer a question. 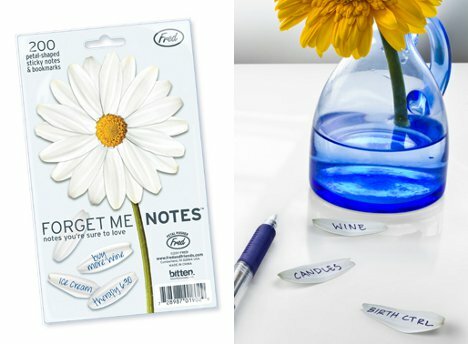 The “she loves me, she loves me not” theme is repeated here in Forget Me Notes, a fun pad of sticky notes that lets you peel petals off one by one, writing short notes on each as you go. Obsolete technology often draws a sort of cult following composed of people who just don’t want to let go of the past. 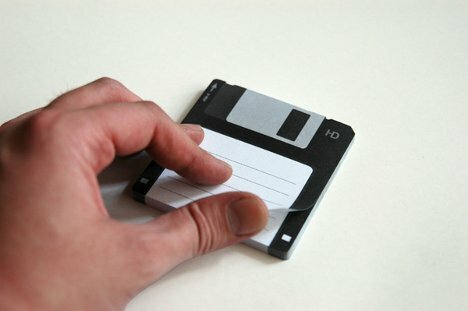 The floppy disk is one such object whose time is over, yet it keeps showing up in design. At least this sticky note version of the disk won’t lose your data…because it’s written right on it! 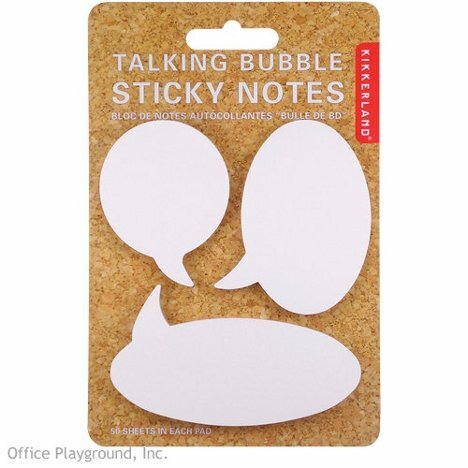 Whether you take the tactic of comic book action or plain old speaking, speech bubble sticky notes are a fun way to add a bit of conversation to photos, memos, your cubicle walls…anywhere you can get a note to stick. The Trashed sticky notes are for those days that a crisp, sharp, bright yellow note just is not called for. 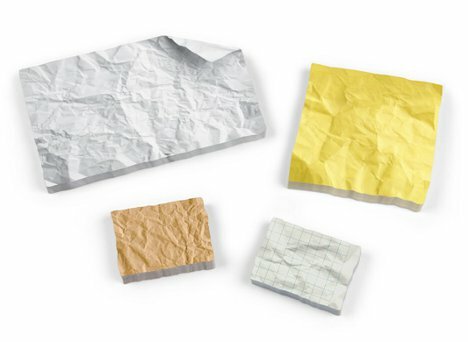 A printed pattern makes the notes look as though they have been crumpled up, thrown away, and dug out of the trash just to be used again. Why choose between lumber and paper when you can have both? 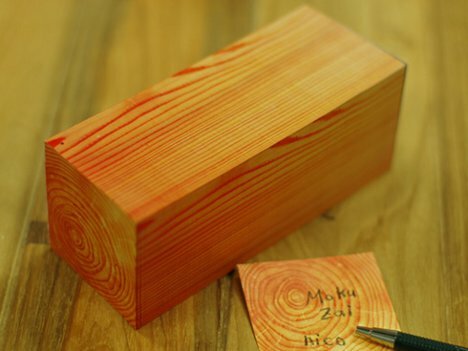 The Wooden Memo Block looks like a square block just sitting on your desk wasting space. 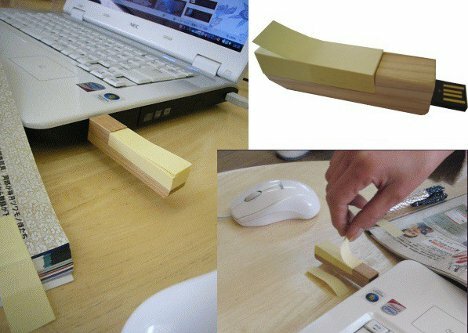 But look a little closer and you’ll see it’s actually the perfect way to keep people from stealing your sticky notes: by making them look like something else entirely. Combining high technology with low technology, the USB Sticky Note Pad offers a way to store your digital data as well as leave a more tangible copy of whatever you want to say.